Chainsaws were once the exclusive tools of farmers and lumberjacks. Today, many homeowners use them for cutting firewood, pruning trees and building fences. As they’ve grown in popularity, so have the options! 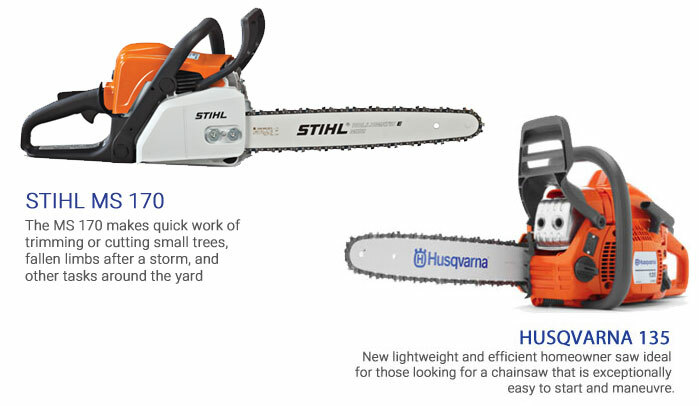 Stoughton Lumber has a wide selection of Husqvarna and Stihl chainsaws to choose from. We are here to help you make a smart and informed chainsaw purchase. More importantly, we want to you to stay safe. Stop in today and we can help you select the right chainsaw to use based on the size and type of wood you will be cutting. Along with a great selection of chainsaws, we also carry replacement chains and offer sharpening. Husqvarna chainsaws are ready for any project, from cutting firewood to tree care. They deliver enormous power, with ergonomic design. The gas chainsaws are all equipped with the unique X-TORQ® engine which makes them less fuel consuming and reduces the exhaust emission levels in accordance with the world’s most stringent emissions regulations. Husqvarna chainsaws are available at Stoughton Lumber. STIHL Inc. is an award-winning U.S. manufacturer. They take great pride in their products and the awards they receive. The STIHL brand is synonymous with professional chain saws and is the number one selling brand worldwide. STIHL is committed to designing and building high quality and innovative products. They are committed to their employees and to the future of the power equipment industry. Stihl chainsaws are available in Orfordville.